Growing and upping her game as a stylist is the natural hair enthusiast and protective stylist, Mapula of Diva_Maps. She started braiding and cornrowing hair as a hobby whilst still at school in 2000. The demand continued to grow and she soon saw it as a lucrative business for her natural flare in styling hair. In-between studying full time, she began building her brand in 2010 and has many a great plan for the future. Mapula will be graduating early 2016 with a Marketing and Business Management degree - talk about beauty and brains. She has always had a love for natural hair and is continuing to research and understand it more. She believes in maintaining the integrity of our hairlines whilst at the same time caring and looking after our natural hair in a healthy and nurturing manner. Her focus is to braid and install beautiful protective styles and do this correctly. Whats does correct mean? As already mentioned, in a way that reduces the added tension to the hairline and reduced breakage, if any at all, whilst protecting the hair. She believes in her hair, she believes in our hair and in maintaining it in its natural state. She believes in protective styles - that they are utilized to help with hair retention. She doesn't just braid, she can help with twists, cornrows etc etc of one's own hair to last longer than a week. (I need more of this) She believes in giving the hair a break in between protective styles and advises her clients in the best way to take care of their hair. Currently working from home, Mapula hopes to train one or two more assistants who share her passion for hair so as to allow her the time she needs to further establish her business. She is booked 7 days a week and starts at 7am often ending around 10pm or even later each day. Her skills and techniques are high in demand and time is truly money for her therefore time to enhance her vision is scarce at the moment. Her vision - Think a future number of Diva_Maps salons specialising in protective styling - the good way and she does not want to own any hair driers in her salon as she has seen how heat damages the hair (Mapula knows how to braid/cornrow damp hair), think good quality Diva_Maps hair for the protective styles, think easily accessible advise on how to care for your protective styles and natural hair in general. Working from home gives her the freedom to run her business and work her hours as she sees fit until she has sufficient capital to set up a more viable location. Come with your hair already washed and conditioned. I deep conditioned overnight and rinsed this out as well as detangled the next morning. I then put my hair into 4 twists and went to Mapula's home aka studio. I carried my own leave in conditioner and hair butter with me, but Mapula does have ready on hand the Earthy Hair Care range to use on her clients. We used the expressions range of synthetic fibre/hair to incorporate into the style as I wanted some extra length, some colour and my own hair needed some extra hold to help keep the style in longer. She used this from her stock which was great. We started around 7:30am and were done by 8:45am...1 hour 15 mins and R150 is all it took. (2015 prices) I am tender headed as you know - that means, I do not like and neither does my scalp like pain and I wince at any unnecessary pulling but Mapula didn't pull too much, she needed to be a little firm for the style to hold but didn't make me wince, maybe close my eyes lol, but not wince. My hairline is neat but not pulled tight. She said she does not start 'planting' the synthetic hair at the hair line as this does indeed put extra additional tension there. Would I go to Mapula for a protective style again - a definite yes and I need to book asap as 2016 is already filling up. Yes, you read right. Mapula can be found on Facebook and Instagram where you will find more proof of her beautiful work. I am so looking forward to a good break on the beach with effortless hair and my hair couldn't agree more. 2 weeks later - I kept the style in for 10 days which for me is progress lol. My scalp was just not happy with me and the cornrows in the back started curling upwards and started pulling the hair more and I ended up having annoying and itching bumps in that area. I did wash my hair every other day as I was in water alot (beachbaby) and oil and spritz the scalp. After taking down the cornrows it took a while to recondition my hair and bring back my curls - a number of deep treatments. I took the opportunity to do another henna treatment to revive the colour and add protein. My hairline is still in tact. I did have some breakage or shedding rather which is normal. I was left thinking how do women do this all the time? Like my scalp was just not impressed with this choice of styling or maybe its just me not being used to it. I will ask Mapula to reduce the pulling/tension next time regardless of the fact that my hair may not hold the style for long. One really does need to give the hair and scalp extra extra TLC during protective styles else the effects are not protective but can be quite drying and damaging. I love the review, I also love the braid on your hair. Thank you Lebo, much appreciated. Oh wow, thank you for the love, will certainly do that post for you (have the idea listed, just need to visit more salons). Early January I decided to colour my hair at home (nothing new as I have done so for years in the past). This is after experiencing a Demi colouring session applied by a professional. Why go back to colouring at home you might ask...because the stylist who applied my colour is no longer at the salon I went to AND I'm not ready to trust anybody else, nope not with colour. (see my post on my demi colour experience HERE) plus I didn't want to pay so much for a service/treatment I wasn't sure I was going to be happy with if I had to go anywhere else. Here I am or there I was, sucked it up and coloured my hair at home. Now, I was using Inecto before doing the demi, but this time around I decided to try Dark and Lovely's Colour Intensity Amber Blonde which they have recently released on to store shelves. Umm you will notice that I am drawn to the blonde colours lol. Before I start another series offering more product reviews, I thought I would just briefly mention my shopping experience with a new entrant into the locally based hair care importers arena - http://www.african-flair.co.za. I would at this point also like to remind you to always make contact and inquire from other platforms about online stores you are not sure about before buying. (see my post on online shopping HERE) A recent warning from a very disheartened shopper (which really saddened me and I hope she will get her comeuppance) reminded me that things change, a store that is great today may be bad tomorrow, and so its always good to do a sort of mini security check on them before making payment so as to make sure that they still exist and to make sure that they still have good customer service. Just to remind you that I stock and sell gorgeous earrings and stickers (wall stickers included) and more. My sister and I always wanted more items like these and once we found them, we wanted you to be able to have them too. We want to surround ourselves with 'visual affirmations' or 'statement pieces' that are about us and embrace us and our hair. Items in line with #RepresentationMatters. AND. We know you do too. We have been selling these at hair and beauty events and via email since 2016 and will be launching an online store soon. 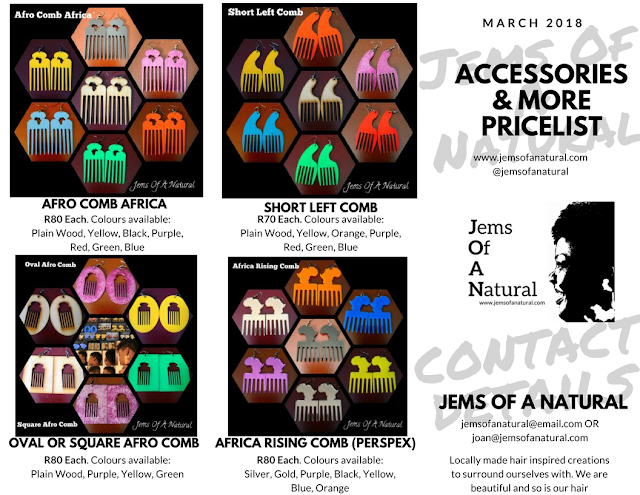 For now you can send an email to order to jemsofanatural@gmail.com OR joan@jemsofanatural.com. Nationwide delivery is available via courier to central locations for R60 or for outlaying areas Postnet to Postnet, whichever is cheaper.